Cabinet Committee for Economic Affairs (CCEA) approved the proposal for opening of 13 new Kendriya Vidyalayas (KVs) in seven States-Uttar Pradesh, Maharashtra, Manipur, Telangana, Bihar, Jharkhand and Karnataka. The CCEA also approved the establishment of an additional Jawahar Navodaya Vidyalaya (JNV) at Alot, Ratlam District, Madhya Pradesh. Ratlam district of Madhya Pradesh has a high percentage of SC and ST population and there is huge demand for establishing an additional JNV in that district. CCEA approved issue of fresh 13, 87, 82, 700 equity shares to the extent of 15 percent of paid up equity capital efface value of Rs 5 each by Hindustan Copper Limited (HCL) through the Qualified Institutions Placement (QIP) route, as per SEBI guidelines. As a result, Government of India’s shareholding in HCL will come down from 76.05 percent to 66.13 percent. The paid-up share capital of HCL will increase from the present Rs 462.61 crore to Rs 532crore. The raising of fund is essential for HCL’s expansion plans to achieve production level of around 1.90 lakh tonnes of metal in copper concentrate and thus meet around 30 percent of the refined copper demand of the country. The Union Cabinet on August 2, 2018 approved anti-maritime piracy bill provisioning death penalty or life imprisonment to those involved in piracy at sea with an objective to have a domestic anti-piracy legislation to provide the necessary legal framework within the country for the prosecution of those involved in piracy-related crimes. The law is aimed at promoting the safety and security of India’s maritime trade including the safety of its crew members. The Indian government is bringing the law as a part of its commitment made while signing the United Nations Convention on the Law of the Sea (UNCLOS) in 1982. The UNCLOS was ratified by India in 1995. The Union Cabinet on August 1, 2018 approved acquisition of IDBI Bank’s controlling stake by Life Insurance Corporation of India (LIC) as promoter in the bank. The acquisition will be done through preferential allotment or open offer of equity and through relinquishment of management control by the Government of India. The Cabinet has also approved reduction in Government shareholding in IDBI Bank Limited to below 50 percent by dilution. The Supreme Court on August 2, 2018 issued a slew of directions to revamp judicial infrastructure and the quality of justice administration in courts across the country. A bench of Chief Justice Dipak Misra, Justices AM Khanwilkar and DY Chandrachud ruled that the strengthening of court infrastructure requires the immediate attention in the form of planning, enhanced budgeting and structured implementation. The provision of basic infrastructure facilities in all courts is essential as infrastructure forms the core for efficient dispensation of speedy and qualitative justice. The United Arab Emirates (UAE) on August 1, 2018 launched a landmark three-month visa amnesty programme, which will benefit hundreds of illegal foreign workers, including Indians, who are overstaying their permits in the gulf nation. The overstaying residents will have the option of exiting the country without paying the fine or facing punishment or to rectify their status by getting a new sponsored and valid visa. Overall, it’s the fifth general amnesty since 1996 and more than 60,000 people took advantage of the last one, in 2013. India and Germany on August 1, 2018 signed an agreement on financial and technical cooperation, with a special focus on sustainable urban development and renewable energy. The agreement was signed between German Ambassador to India, Martin Ney and Joint Secretary, (Department of Economic Affairs), Finance Ministry, Sameer Kumar Khare. The bilateral agreement will help reduce the emission of greenhouse gases and also help India in achieving its goal of curbing such emissions. 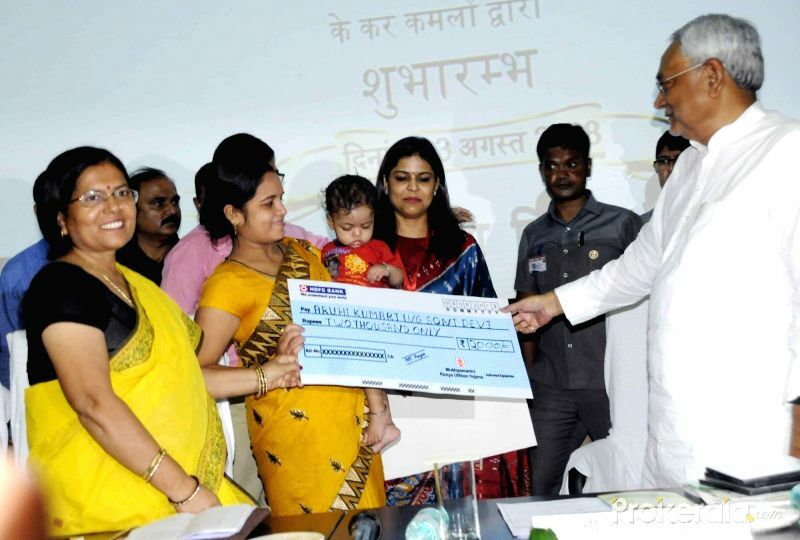 Bihar Chief Minister Nitish Kumar has launched an ambitious scheme, ‘Mukhyamantri Kanya Utthan Yojana’ which promises to provide Rs. 54,100 from the birth of a girl child till she graduates. The ‘Mukhyamantri Kanya Utthan Yojana’ will be run by three departments — education, health and social welfare. 1. In-line with which of the following laws Union Cabinet approved anti-maritime piracy bill? 2. The Union Cabinet approved acquisition of ___ Bank’s controlling stake by Life Insurance Corporation of India. 4. How many general amnesties have been launched by UAE since 1996? 5. With which country India signed an agreement on financial and technical cooperation, with a special focus on sustainable urban development and renewable energy? 6. Which state launched ‘Mukhyamantri Kanya Utthan Yojana’?